Spray 3 1/2- to 4-quart slow cooker with cooking spray. In cooker, place beef roast. Remove green tops from onions; chop and refrigerate. Chop white parts of onions; sprinkle over beef. In small bowl, mix remaining ingredients; pour over beef. 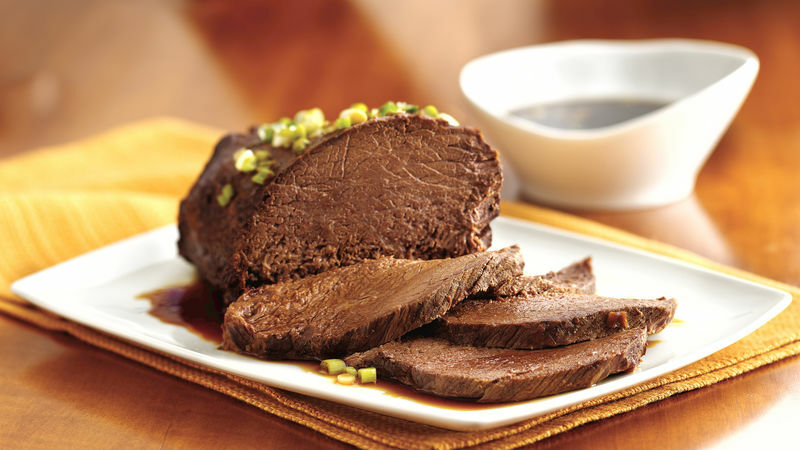 Cut beef into slices; place on serving platter. Serve with sauce; garnish with green onion tops. If desired, substitute teriyaki sauce for soy sauce or substitute 1 small onion, diced, for chopped green onions. Accompany this roast with hot cooked rice and canned teriyaki vegetables.